High Visability Safety Sing with Multi-lingual text on both sides of the sign. Wet Floor Sign with Male/Female Attendance, 5 per pack. Yellow high-visible Barrier chain for use with wet floor signs and cones. Instantly recogniseable safety sign that is guaranteed to attract attention. 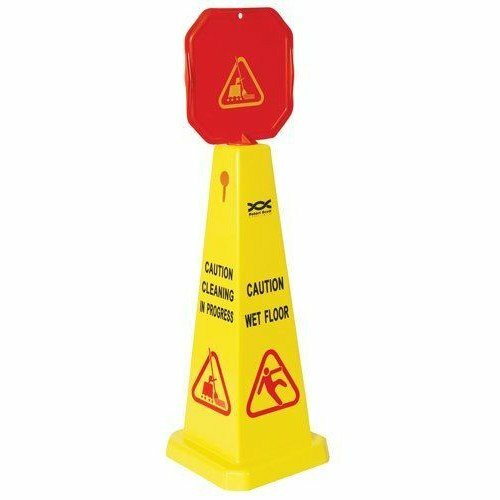 High Visibility Wet Floor Cone. 90cm (36inch) Height. This wet floor safety cone is brightly coloured and 90cm (36inch) high for extra visibility. To use on wet floor caused from weather conditions, water spills or from general wet floor cleaning. To warn customers, staff and general public about wet flooring which could cause potential slip hazards. Perfect for working environments, public spaces and organisations. This is essential for cleaning companies to follow health and safety regulations. Slipping and falling accidents costs businesses millons of pounds a year in compensation, ensure you comply with the latest Health and Safety Laws. Ensure maximum visibility with this 90cm (36') 4-sided floor cone.